If you own an Amazon Echo device and are concerned about privacy, you’ll want to delete your voice recordings from the cloud. Here’s how. When you summon Alexa on you Amazon Echo device and speak a command, it’s uploaded and saved to your Amazon account. The more you use it, and the more Skills you add, the more Amazon and the linked services know about you. Personal information that is stored can be your music and movie preferences, what time you get home, the time you go to bed and more. 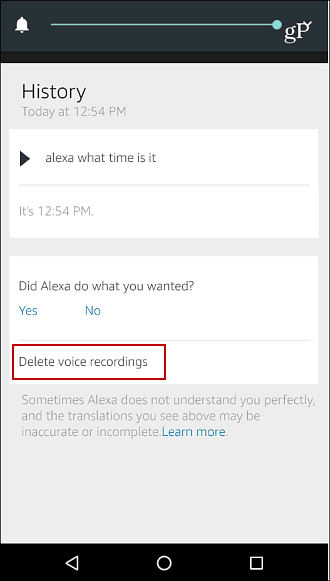 Alexa on the Echo will be triggered even if you don’t give it the wake command and start recording the audio in the room. Even when you activate it, it records what other people are saying in the background. Some of my recordings included 30 seconds of what I was watching on TV. They get triggered a lot and record a lot, and it’s all stored on Amazon servers. If you’re worried about your privacy and don’t want your voice commands stored in the cloud, here’s how to delete your activity. 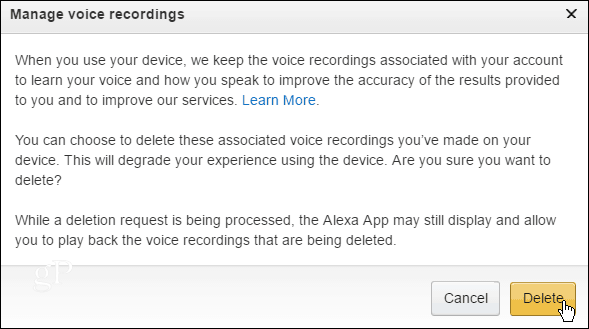 Deleting voice recordings may degrade your Alexa experience. If you delete voice recordings, we will also remove Home Screen Cards related to those voice recordings. There are a few ways to manage the history of your voice recordings. You can use the Alexa app on your mobile device, Fire TV, or the Alexa web interface. For this example, I’m using the Android app, but the steps are virtually the same on the other platforms. 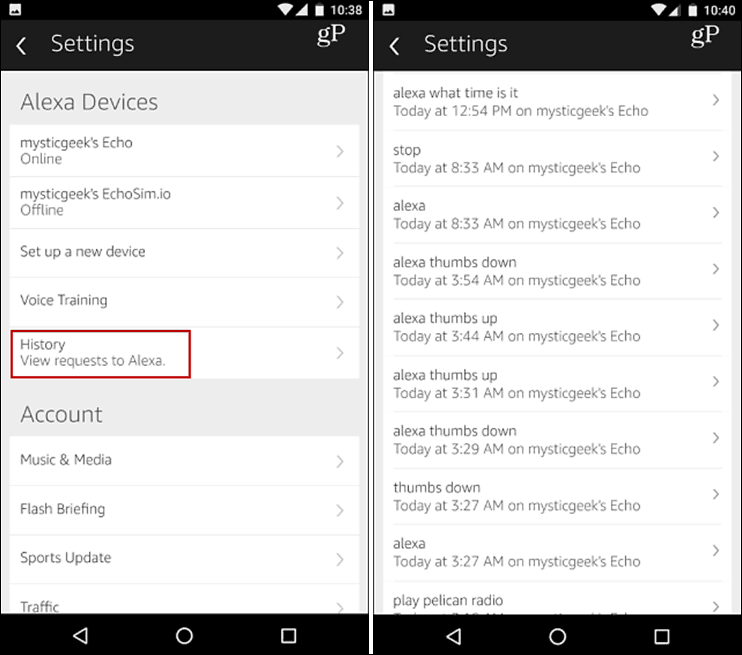 Launch the Alexa app and go to Settings > History to find a list of your past Alexa requests. Tap or click on a recording that you want to remove and then choose select Delete voice recordings. If you want to delete all of your voice recordings in one fell swoop, then you need to head to the Amazon website. Head to Manage Your Content and Devices (you’ll need to sign in if you aren’t already) and select the Your Devices. 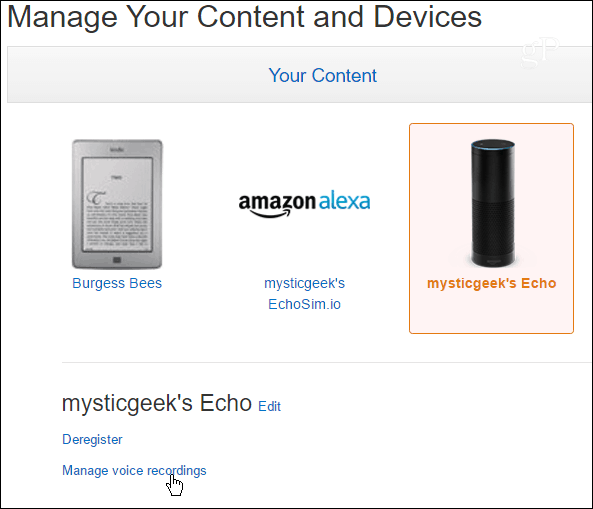 Select your Echo device and then select Manage voice recordings under your Echo’s name. Read through the disclaimer that comes up, and then click the Delete button. That’s it. All of your voice recordings will be deleted. It’s worth noting that you can also play back all of your recordings, too. It’s kind of creepy hearing yourself and knowing that everything you say to Alexa is recorded and stored on Amazon’s servers. The good news is you can remove the recordings either individually through the app or all at once via the Amazon website. What’s your take? Did you know every command you speak to Alexa is recorded and will you remember to delete them periodically? I have tried this several times and Dot is not working. I have to dredger each message one at a time. Help would be appr coated.